Advanced fabric construction incorporating ring spun brushed polyester with the latest in moisture management technology.High tech sheet with sure fit neck design, V-front closures, leg arches for freedom of movement, cross surcingles and fillet string. 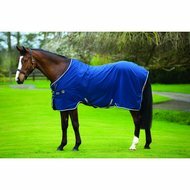 A versatile rug, it dries horses quickly and can be used as a cooler, stable sheet or travel sheet. Co-ordinates with the rest of the Rambo range. 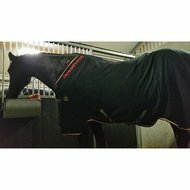 Beautiful blanket with an excellent fit! Too bad that there are no cross surlets on it. 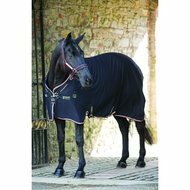 Blanket is large, therefore had ordered a size smaller and it is excellent! Very nice blanket, both suitable as summer blanket and sweat blanket. I am very satisfied with the fit, only order one size smaller because it really is one size bigger! Beautiful blanket. Only falls very big. 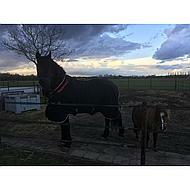 My horse is 1.80 high but 215 was too big for him. Answer: This brand is indeed somewhat larger. I would order the same size of this blanket if you have the other Rambo blanket.